I've been following-up a rather obscure strand of Coleridgean reading, which I'll probably blog about in a day or two (to get it off my chest). But I wanted to stop for a moment to note how pretty this title page is. Don't you think? It's something STC read (though not in this 1526 first edition; he read a later 4-vol collected ed from 1780), by Juan Ginés de Sepúlveda (1494-1573), famous Spanish Renaissance humanist, theologian and translator of Aristotle into Latin. The ‘Io. 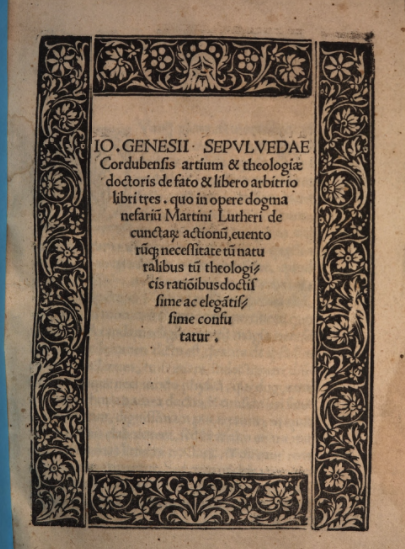 Genesii Sepuluedae’ is the Latinization of Sepúlveda's name, ‘Cordubensis artem et theologiae doctoris’ means that he's a Doctor of Arts and Theology of the University of Córdoba in Andalusia, and finally we get to the title of the volume: De Fato et Libero Arbitrio Libri Tres, ‘On Fate and Free-Will, in Three Books’. It's Sepúlveda's attempt to refute Luther's opinions on fate and Christian theology, part of the broader discourse of the Counter Reformation. 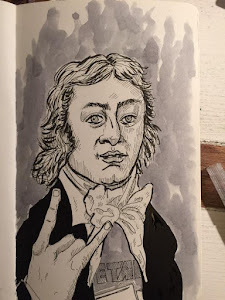 That Coleridge read it at all is fairly interesting, and it was something concerning which he has Thoughts, but for now I only note how lovely the design is, here.